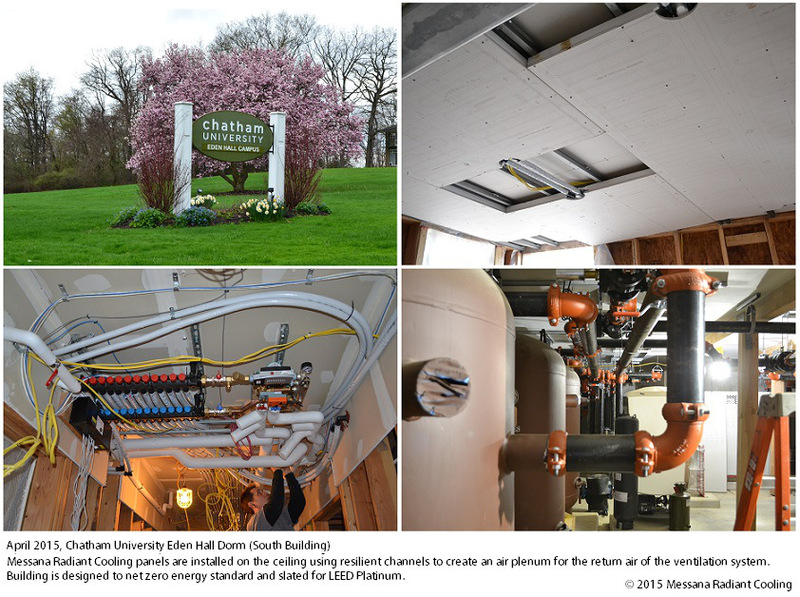 Messana Radiant Cooling system is installed in the new modern Chatham University’s Eden Hall campus (South Building Dorm). Messana Ray Magic panels are installed on the ceiling using resilient channels to create an air plenum for the return air of the ventilation system. The dehumidification and ventilation system consist of four 1200 CFM ATU (Air Treatment Units) installed in the attic. Each unit is composed by an Heat Recovery Ventilation unit (Messana Air Magic HRV1200) combined with a Neutral Temperature Dehumidifier (Messana Air Magic NTD1200. Messana radiant panel system will also integrate radiant cooling and heating control system (Control Magic climate control platform) with dew-point and meant radiant temperature sensors installed in each room of the dorm. The radiant system will be powered by geothermal systems and the building also features photovoltaic and solar thermal systems. Eden Hall will be self-sustaining in every way by emitting zero carbon emissions, managing all storm and waste water on-site, and producing more energy than it consumes. Building is in fact designed to net zero energy standard and slated for LEED Platinum. The new lodge housing will accommodate up to 100 students. Each room is equipped with independent radiant cooling and heating system for the best comfort of each student. Read more about this new radiant cooling project.